In Kingdom Hearts Birth by Sleep, Ragnarok allows the user to fire multiple small fusillades rather than a single simultaneous bombardment. Ragnarok (ラグナロク, Ragunaroku? ), translated as "Infinity" in Kingdom Hearts II, is a technique introduced in Kingdom Hearts. It allows the user to fire a cluster of energy shots from the tip of their Keyblade. In Kingdom Hearts, Ragnarok allows the user to strike the enemy with the Keyblade before firing several projectiles at it. In Kingdom Hearts, Ragnarok is a Special Ability. When close to an airborne enemy, selecting the Ragnarok command will cause Sora to automatically jump up to the enemy and deliver a five hit aerial attack combo, after which he will hover while charging energy into a sphere from the tip of the Keyblade. Unlike Sonic Blade or Ars Arcanum, it requires no timing to execute the finisher, Impact (インパクト, Inpakuto? ); however, the longer Sora charges before using Impact, the more projectiles are fired and the heavier the damage, with the optimal time being the instant the Keyblade releases a circular flash of light. The projectiles home in on enemies after being fired, while Sora can move freely. Waiting too long to use Impact causes the energy to dissipate without releasing the projectiles. Sora is invincible during the initial weapon combo, but when Sora is charging the projectiles, he is left vulnerable to damage. In the Kingdom Hearts HD 1.5 ReMIX release of Kingdom Hearts Final Mix, the initial Ragnarok command and the Impact command are implemented as Reaction Commands. Ragnarok costs 4 AP to equip and 3 MP to use. In Kingdom Hearts Chain of Memories, Ragnarok allows the user to fire several beams which fly through enemies uninhibited, allowing the attack to ravage most of the battlefield. In Kingdom Hearts Re:Chain of Memories, Ragnarok's projectiles instead home in on a single enemy. In Kingdom Hearts II, Infinity is a limit that is exclusive to Genie. The limit begins with Infinity, in which Sora and Genie act as one unit to move forward while punching at enemies while their weapons fly about them. The left analogue stick can be used to steer direction. Afterwards, Impact causes Genie to click his fingers three times as Sora uses their weapons as a clock counting down to generate a large explosion of firework-like magic explosions. In Kingdom Hearts II Final Mix, Infinity acts as a combination of both earlier versions, allowing the user to strike the foe several times before firing a fusillade that slowly spirals in on it. In Kingdom Hearts II Final Mix, Infinity is also an action ability exclusive to Limit Form. It is a limit that is equipped by default and costs 80 MP to use. It is automatically assigned to in the shortcuts menu. On activation, Sora performs an aerial attack combo and then uses his Keyblade to charge up energy in the air. Then, the energy releases homing projectiles through one out of several Reaction Commands, which are available in quick succession and vary in projectile quantity. Shoot is the weakest attack and is eventually replaced by the more powerful Impact attack. Soon after, there is a brief opportunity to execute Giga Impact, which fires the most projectiles. Afterwards, Shoot is available again and is executed automatically if too much time passes. Each individual projectile deals damage relative to two-thirds of Sora's Magic stat, as well as Neutral damage that bypasses physical defenses. In Kingdom Hearts 358/2 Days, Ragnarok allows the user to fire shells of energy rather than beams or shots, and it spreads them away from the user, rather than homing in on a target. In Kingdom Hearts 358/2 Days, Ragnarok is Sora's Limit Break. It allows Sora to lift into the air and gather thin lasers into a sphere, which can be fired with , releasing projectiles that home in on enemies to deal heavy damage. The lasers can be charged up until a prime point, signalled by a white flash, whereby releases the maximum number of projectiles. The Final Limit also releases trios of spinning capsule-shaped beams, which travel in a straight line to deal devastating damage to enemies and pierce their guard. In Kingdom Hearts Birth by Sleep, Ragnarok is a Shotlock that has a maximum level of 4 and max lock of 16. Once the attack has begun, the player can perform extra attacks by pressing at the right time to fire additional projectiles. In Kingdom Hearts 3D: Dream Drop Distance, Ragnarok is a Dual Attack that allows the user and Spirits to fire countless projectiles, dealing Light-elemental damage. In Kingdom Hearts III, Ragnarok is the max lock ability for the Kingdom Key, Midnight Blue, Phantom Green, and Dawn Till Dusk keyblades, requiring 24 locks to use. Sora learns Ragnarok after his second encounter with Riku, in Hollow Bastion. Sora can learn Ragnarok after reaching level 47. Sora can learn Ragnarok after reaching level 52. "Final" Genie has Infinity as his limit. Limit Form has Infinity as a default ability accessible from the Limit menu. Sora has Ragnarok as his Limit Break. Terra, Ventus, and Aqua can purchase Ragnarok from a bonus panel on the normal Keyblade Board. Sora can use Ragnarok by Dual Linking with a Water-attribute and a Dark-attribute Spirit. Sora can use Ragnarok by Dual Linking with two Thunder-attribute Spirits. Sora can use Ragnarok by Dual Linking with a Thunder-attribute and a Light-attribute Spirit. Sora can use Ragnarok by Dual Linking with a Thunder-attribute and a Dark-attribute Spirit. Ragnarok is one of the shotlocks for the Kingdom Key, Midnight Blue, Phantom Green, and Dawn Till Dusk. Xion's version of Ragnarok causes her to launch long-lasting projectiles from the tip of her weapon that slowly home in on the player character. 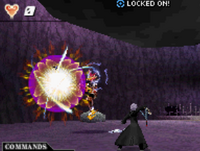 In her second form, Xion can use Ragnarok against the player if too much distance is maintained. The attack is Nil-based and ignores defense completely. Sora uses the Kingdom Hearts iteration of Raganarok as the final part of his Champion Summon. Ragnarök is an event in Norse mythology that is similar to the Apocalypse. It is an event that is set off by the death of the god Balder, which was orchestrated by Loki. The Ragnarok was a final clash of all the major entities of Norse mythology. This caused all of the human spirits up in Valhalla to come down for the final battle. This bloody encounter ebbs with the destruction of the universe and Balder along with a little handful of entities that are put in the bodies of children and only contain memories of the world before Ragnarok. Those entities would become mortal. Ragnarok is also a recurring Summon and weapon that appears in various games in the Final Fantasy series. It also appears as an airship and a legendary beast. In Kingdom Hearts, when Ragnarok is fired just after enemies are cleared in a room, the projectiles will fly and lock on to a specific spot often out of Sora's reach, as opposed to scattering in random directions. In the Italian version of Kingdom Hearts, Ragnarok is mistranslated as "Laguna Rock". This page was last edited on 3 April 2019, at 18:33.